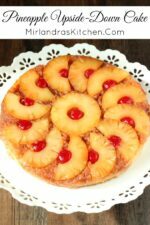 An easy moist cake, perfectly caramelized slices of pineapple, and a hint of cinnamon make this the best Pineapple Upside-Down Cake we have ever had. This is a classic worth making again and again. My father completely adored pineapple upside-down cake. His one complaint was that nobody put enough pineapple in it! Over the years I saw him bake them different ways until finally he just started putting crushed pineapple in the bottom. He said that way you got some with every bite! While Dad’s method was effective I didn’t think it was very pretty. Half the fun of pineapple upside down cake is how pretty it looks when you flip it out of the pan! I have finally solved the problem to my satisfaction by slicing each ring of pineapple in half. Now the cake is beautiful and there is lots of pineapple! Dad passed away six months ago but I can imagine his giant grin if I brought him this cake. We enjoyed this cake plain with friends a few weeks ago but I it is also nice with a scoop of vanilla ice cream or a dollop of whipped cream. Tools In This Post: If you bake quite a bit it is worth owning a springform cake pan like this one. I have several of different brands. All of mine are non-stick but I don’t have a favorite brand. Mine all perform the same. 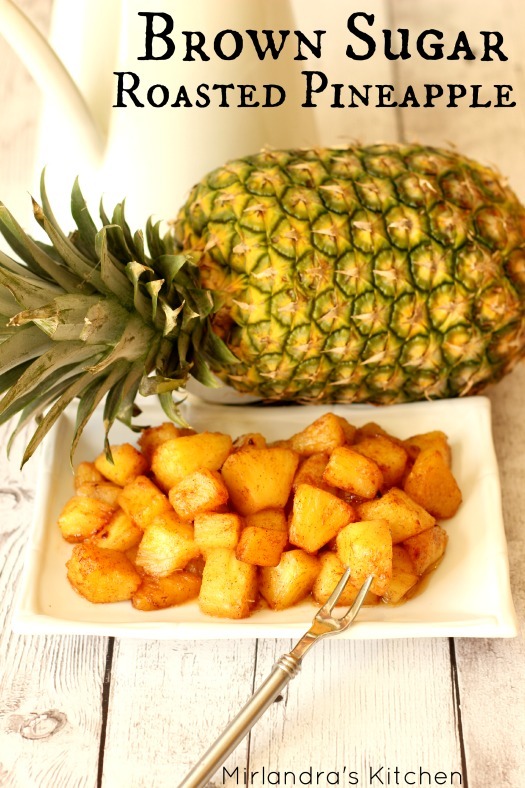 If you love pineapple, make sure to give my Brown Sugar Roasted Pineapple a try. It is perfect with an Easter ham, BBQ ribs or really just about anything! Adjust an oven rack to the middle of the oven. Preheat oven to 350F. In a small bowl, melt the butter in the microwave. Pour the butter into a 9-inch springform cake pan (a regular 9” cake pan does not have tall enough sides.) Rub a bit of the melted butter up the sides of the pan to grease them. Scatter the brown sugar evenly over the butter. Arrange the pineapple rings and cherries in the pan: Start with 1 whole slice of pineapple in the center of the pan. Cut the rest of the rings in half and arrange 12 halves in a circle around the original pineapple ring. If you have additional haves left you can eat them or tuck them into the sides of the pan after you pour the batter in. Sprinkle the cinnamon over the fruit. In a large bowl, whisk together flour, sugar, baking powder, and salt. Set aside. In a medium bowl whisk together the egg, buttermilk, sour cream, oil and vanilla. Add the wet mixture to the dry, folding with a spatula until just the mixtures are combined. Do not overmix, it is ok to leave some small lumps in the batter. Scrape the batter into the pan over the fruit. Be careful not to mess up your arrangement. If you want, tuck the extra half pineapple rings into the sides of the pan. Place the round side down a few inches apart. 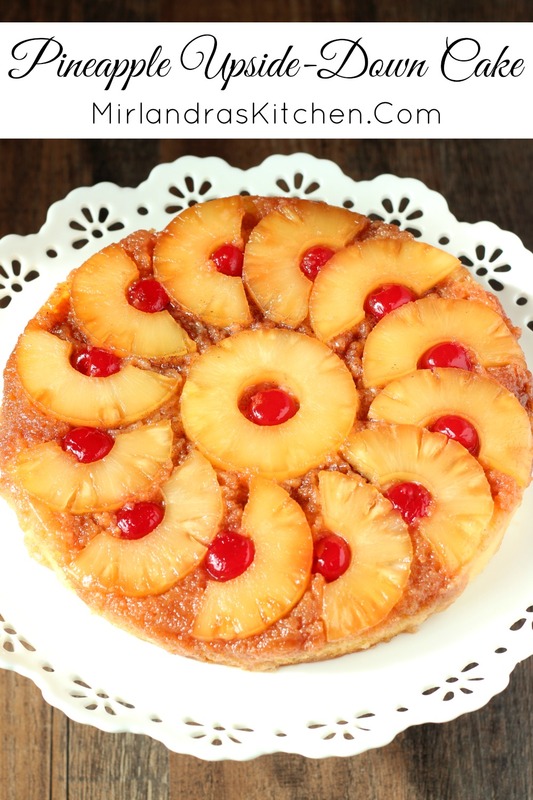 This gets just a bit more pineapple in the cake and makes the sides quite pretty. Bake for 38-40 minutes. The cake is done when the center is set and a toothpick inserted 1” into the center of the cake comes out with a few moist crumbs but no batter. Place the pan on a wire rack to cool and set up for at least 30 minutes and up to overnight. If you plan to leave it overnight place a sheet of foil loosely over the top to keep the moisture in. Run a thin spatula along the edges of the cake pan to make sure the cake is loose from the sides. Carefully invert it onto a serving platter and serve. This cake is good by itself or paired with a dollop of whipped cream or a scoop of vanilla ice cream. Store leftovers at room temperature for up to 3 days. Some people have issues with their spring form pans leaking. I've never had this issue and believe it has to do with quality differences in how the pans are made. I suggest lining a cookie sheet with foil and putting it under your pan the first time you make this cake just in case! Recipe adapted from The Joy of Cooking. Your cake looks wonderful… and I do like the idea of cutting the pineapple in half as you have done… not only do you get more pineapple in each bite, but it looks nicer too. Im so sorry about the loss of your dad. Thank you for your kind words. I will always miss him but time eases the hurts and I have many wonderful memories to treasure. I’m gonna try your dads cake. Thank you for sharing. Thank you for sharing this recipe! I am going to make it on Saturday where it will be enjoyed at a Celebration of my Dad’s life. He passed away in late 2016 and I miss him terribly. He also LOVED pineapple AND CAKE so I know he will be looking down fondly upon us as we celebrate how he much touched our lives. May you and I both have wonderful memories of our great Dads forever! 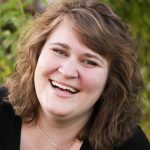 Oh Sara – I’m so sorry about the loss of your father. I know how difficult this moment is. We are coming up on the one year anniversary of loosing my father and while time has eased his passing I do miss him very much. I am so glad you get to share this cake at his Celebration of Life. He must have been very lucky to have you. Thank you so much for sharing- you touched my heart! Was it supposed to rise up high? Mine did not and turned pretty dense. It is not supposed to be very high. It should be a more heavy cake like a pound cake with a nice dense chew. I hope that helps clarify! I’m sorry that happened! I’ve not run into it with my pan but mine is only a few years old and shuts quite tightly. I wonder if your pan does not have a very tight closure? Can I ask what brand our pan is if you know? I’m always on the look out for cooking equipment to avoid or to love 🙂 How did the cake turn out? My springform pan let the butter drip out the bottom. Now I have to clean my oven floor. Hi Charlene – I’m sorry that was your experience. Not all pans are the same quality. I use a washable oven liner like this one (https://amzn.to/2UB7Mlo) so that I don’t have to deal with clean ups when I get surprised! I hope the rest of your holiday baking goes better and you don’t have any more oven messes to contend with! ABSOLUTELY amazing! This was a hit! Scratch… not anymore! Thank you! Hi Delana – So glad you enjoyed the cake! Cook on!